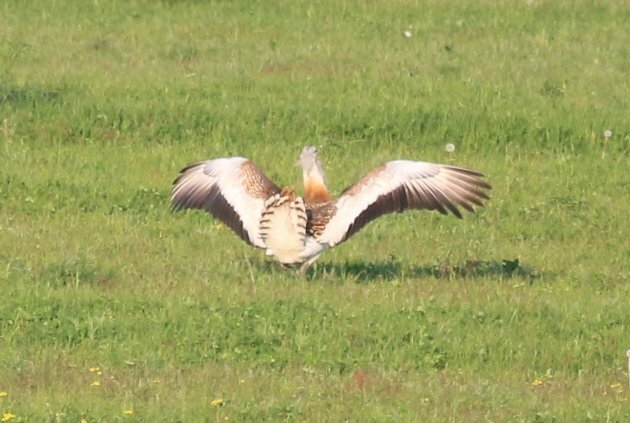 I am not entirely sure whether most birders outside Germany know or realize that Germany still has a decent population of one of Europe’s most attractive and desired bird species: the Great Bustard Otis tarda. This species, one of the heaviest birds able to fly, was once common through most of southern and central Europe and all the way to Mongolia, but was driven to extinction by hunting and changes in agricultural practises in most of its European range during the 19th and early 20th century. Today, birders wanting to see this avian gem usually venture to the healthy populations of the Iberian peninsular or travel to Hungary. Now, I am fully aware that Germany can’t rival the overall birding attractiveness of these countries, but it might not hurt to know that you need not go there in search of Great Bustards should you find yourself in the vicinity of good ol’ Germany’s capital Berlin. While Great Bustards vanished from their western German haunts during the 19th century, a sizeable population of around 4,000 birds was still to be found in eastern Germany in the 1940s. Sadly, this population too went into a steep decline until only 57 animals were left in Germany in 1997, raising fears about their imminent extinction in the country. 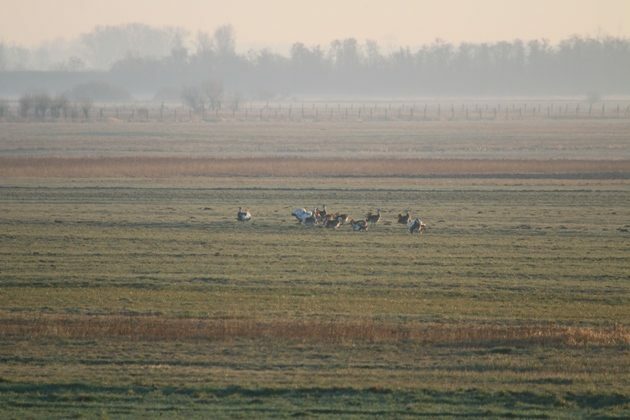 Through intensive conservation management however, this downwards trend was halted and the population stabilized at more or less 100 bustards until 2011. Since then, we have seen a marvellous recovery, with an estimate of 123 in 2012, 145 in 2013, 165 in 2014, 197 in 2015 and now in 2016, around 232 Great Bustards roam the wilds of Germany, nearly doubling their number within just a handful of years! Great Bustards are now (still) restricted to three populations in Germany, all west of Berlin in the wider region of the Havelland. 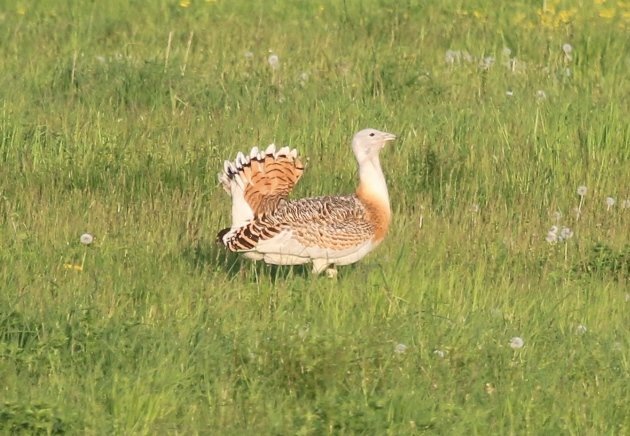 Two of these populations, the ones at “Belziger Lamndschaftswiesen” and “Havelländisches Luch”, are easily accessible to birders and the bustards are more or less guaranteed during such a visit, without any risk of disturbing them. 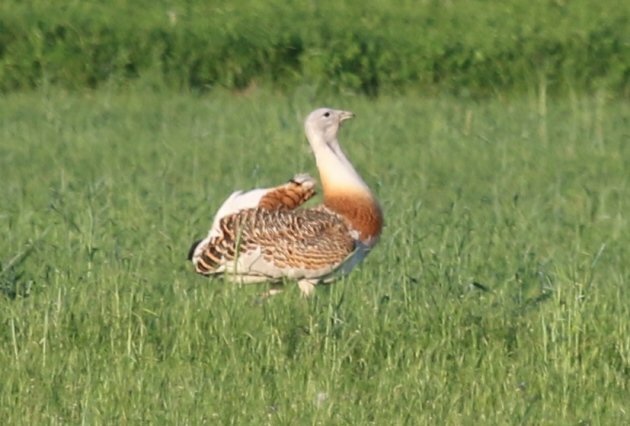 “Without disturbing them” of course translates to “seen at a distance of usually more than 200 m”, explaining why all the following images of the Great Bustards are heavily cropped. …although they do look suspiciously happy when landing. Never mind the slight over-exposure: look at this bird! 1. Belziger Landschaftswiesen: This area is situated approximately 55 km SW of Berlin’s city centre and best reached via the highway A9. From the exit Linthe, follow the rural road L85 towards the village Freienthal. Turn left once you’re in Freienthal (only one road towards the left) and park your car at the village’s edge. Walk on along a sandy track through some fields for approximately 700 m (a bit less than half a mile) until you reach a narrow strip of pine trees. Follow the track through a gap in the pine tree plantation and immediately turn right. Walk to a small abandoned farm and keep on along the track, crossing a small canal via a small bridge (don’t worry about the gate) just after the farm. You will then see an observation tower for viewing the Great Bustards. The walk from the parking area to the tower is a bit more than 1 mile. Once you’re on the tower, the bustards are often seen towards the right. Other interesting species: on the way to the tower, you should see Corn Buntings, Ortolan Buntings (mostly heard), Wood Larks, Yellow Wagtails and Whinchats. The abandonned farm hosts one of the few remaining breeding pairs of Little Owl in Germany’s Northeast, so be aware of this possibility but also take good care not to disturb them should you see them (most likely at dusk). Do NOT walk around the empty buildings trying to see/flush them! 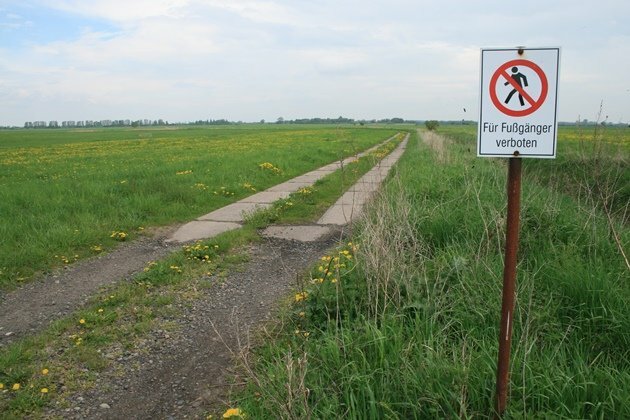 This is prohibited under German nature conservation laws and a moral no-go. From the tower, there should be a few interesting raptors around, and vagrant raptor species are always a possibility during migration periods. Furthermore, you will likely see or hear Eurasian Curlews. According to the observation book on the tower, even wolves are a – very remote – possibility. 2. Havelländisches Luch: This area is around 52 km west of Berlin’s City centre and a bit more difficult to reach since it requires longer drives overland. However, you will usually get much better observations of the bustards, and this is the area I’d favour if I had to choose between the two. There are two tiny villages within the area, and each has its own observation tower. The first village is Garlitz, which you simply have to enter into you car’s sat nav. The other one is Buckow north of Garlitz, but it seems that this village is unknown to most sat navs – for whatever reason. To reach the first tower, drive north within Garlitz towards Buckow but then go straight when the main road within the village turns 90 ° to the left. Follow the track towards the east beyond the village limits through some fields until you reach the tower and park your car right there – no walking required. To minimize disturbance, you’re actually asked to take the car all the way to the tower, so it’s okay, you’re not being lazy. To reach the second tower, take the road from Garlitz north towards Buckow. Around halfway through the open landscape between the villages, just over a quarter mile north of Garlitz, is the turn-off to the right. Again, take the car all the way to the tower, which is three quarters of a mile down the track. Both towers are equally suitable for seeing the bustards, and since you can easily drive from one to the other in 5 minutes, it doesn’t really matter which one you choose. In the open landscape, you can actually see from one tower if the other one offers better options and then just re-locate according to your own gusto. 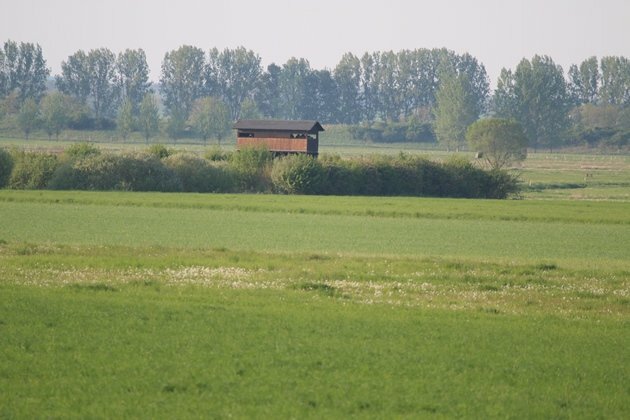 Other interesting species: as with the Belziger Landschaftswiesen, the typical open country species will be easy to see, like Corn Bunting, Yellow Wagtail and Whinchat. I’ve once seen Grey Partridges there, and the meadows have breeding Montague’s Harriers. All other harrier species may also be around, including Pallid Harriers which are recorded each year as (semi-)vagrants. Don’t expect to see Pallids, but be aware of the possibility. The hedge rows along the tracks to the towers host all of Germany’s Sylvia warblers, and yes – this includes Barred Warblers. I once saw a Hoopoe north of Buckow but am not sure if this obervation pertains to a local population or was just a lucky encounter of a migrant bird. 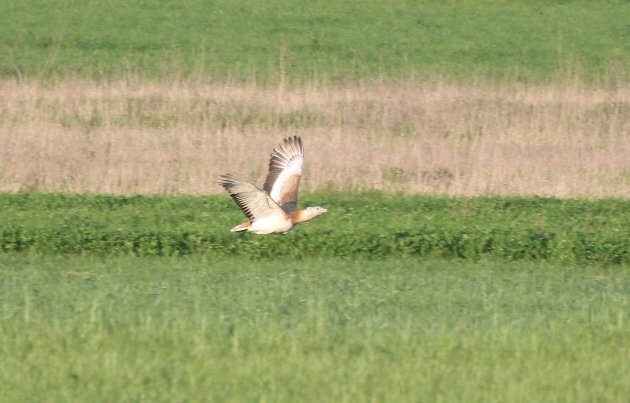 While it is possible to observe the bustards year-round, most birders visit them during their mating season in April. The summer months are less ideal since even birds matching the size of a roe deer can be difficult to spot in high grass, and more search is needed. But even then, patience will usually pay off. 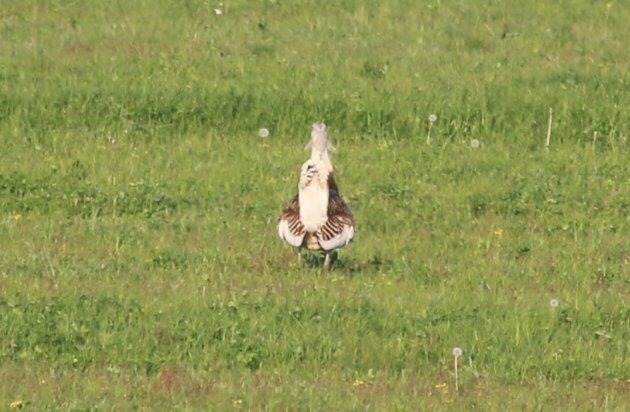 Watching displaying Great Bustards on one of their leks however is one of birding’s greatest shows, and therefore a visit between the middle of March and the beginning of May is strongly recommended. This is a roe deer, not a hare. 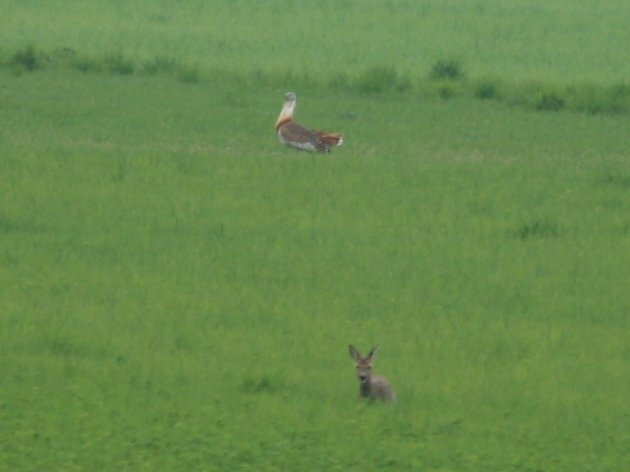 They did not kid when they put the “Great” in front of the Bustard. Now I know what I’m doing the next time I get to Berlin! Thanks! Happy that you enjoyed it and I hope you do get to see the birds.